Mahakalika (Skt. 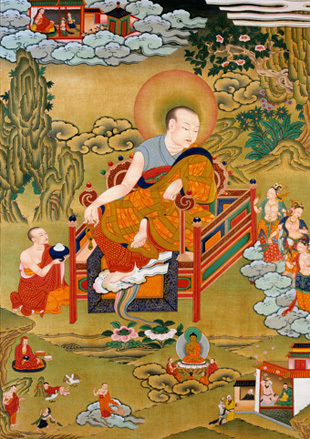 Mahākālika; Tib. དུས་ལྡན་ཆེན་པོ་, Düden Chenpo; Wyl. dus ldan chen po) — one of the Sixteen Arhats. Instructed in the classical studies from an early age, he became a learned scholar, and then joyfully took up the Dharma becoming the attendant of the Arhat Aniruddha. When he came of age, he became a full bhikshu and, devoting himself to meditation, became an arhat. Out of gratitude to the Buddha he resolved to follow his example and dedicated himself to helping all beings. Keeping nothing for himself he dwelt in cemeteries, living on discarded food and clothing. With 1,000 arhats he now lives in Tamradvipa in India. Maha Kalika holds a pair of golden earrings. Through seeing them practitioners become able to penetrate the illusion of samsara and renounce it. Praying to him develops compassion and the ability to set others on the right path. This page was last edited on 12 December 2016, at 12:06.